We live in a society where crime and violence are slowly becoming common, daily occurrences. Teens and young adults are involved as much as adults and sometimes more so in these vices. One of the methods that society uses to control these incidences is incarceration, hence our prison systems are bursting with inmates convicted of varied charges which all stem from inappropriate social behaviors. Most inmates, at some point in their lives, did not receive proper training in discerning right from wrong. They did not receive sufficient guidance to develop responsible behavior and moral competency. This leads to character flaws. The situation changes very little when convicts are incarcerated. Violence is common in prison because the same individuals who were not taught proper social behavior are the ones who end up in prison without any intervention to change their lives. The Peaceful Solution Character Education Incorporated (PSCEI) recognizes that the way to stop, as well as prevent crime and violence, is to educate people in moral values, respect, how to live peaceably with others, how to develop a right, moral character and hence display responsible behavior. The PSCEI has developed a character education program that is changing the hearts and minds of young and old from tendencies toward crime and violence to that of peaceful living, responsible behavior and overall positive social interactions. The Peaceful Solution Character Education Program (PSCEP) promotes five basic principles of positive character development. Ownership: everything belongs to someone and should be recognized as such. Respect: to show care and concern for others and their belongings. Asking: in order to maintain peaceful relationships, one should ask permission before touching or taking something that belongs to someone else. Self-Control: to stop, think about the current situation, examine the options, then proceed with the right choice that will benefit all involved. Do Not Steal: bears on all the above mentioned principles that taking other’s belongings without permission is stealing and forms the root of most crime, violence and war. The PSCEP is guaranteed to make a positive difference in prison systems. Testimonials reveal that people who had disruptive, abusive, violent lives have successfully changed their characters to become peaceful, productive and socially stable. The PSCEP is a perfect guide to responsible behavior. It will help the inmate to develop self-control, morally, responsible behavior and social skills through teaching and problem solving scenarios. Because moral behavior is not taught in today’s prisons and society, theft is often committed inadvertently. Stealing brings an imbalance to the mind of the thief. This imbalance usually leads to acts of violence and many other crimes, including assaults and murders. The PSCEP will teach the students how to conduct themselves with one another. They will learn why it is important to guard the rights and property of others. They will learn why stealing is wrong. The moral values taught in the PSCEP will stop stealing, hatred and acts of violence, but only when they are diligently taught without variation. Conflict Resolution… Self- Control… Honesty… Respect. These are all character traits that must be learned. They are the tools that can be used to foster peace… but until now, they were not put together in a single program that could start with the basics and build to provide complete character education. Applied properly, the lessons taught in this program build a solid foundation. It has been designed so that you can start at any age and see results. No one is too young or too old to benefit from what is included in The Peaceful Solution Character Education Program. We all know what kind of world we live in… but we can live in a better world. It is time to work together to make this world the safe haven that we all want… a place where our children can play outside without fear, where women can walk alone in safety, and where no one is a victim of someone else’s whims. That world is possible through everyone practicing the basic, simple principles taught in The Peaceful Solution Character Education Program. There is always something that you as an individual can do to help to promote peace. The PSCEP begins by introducing basic moral values in simple easy-to-follow lessons. Each lesson builds on the previous one and reinforces the main concepts taught. With each successive lesson, the building blocks of character are laid. Teaching appropriate responses to different situations allows inmates to become more aware of opportunities where they can apply this behavior in their interactions. With time they will begin to exhibit moral excellence in their characters, which will greatly reduce prison violence. Inmates who have learned and practiced new behavioral skills see great improvement in their characters. These changes contribute to a more harmonious and peaceful prison environment. The inmates participating in this program tend to resolve conflicts without violence and have a strong sense of inner peace. They also learn to better cope with their confinement and learn new ways of dealing with problems as they arise. Generally speaking, they are better prepared to be released into the community, to become productive members of society. The PSCEP will reduce recidivism by teaching inmates to never commit crimes and acts of violence again. This program is an effective alternative to incarceration and is also a viable post-release program. 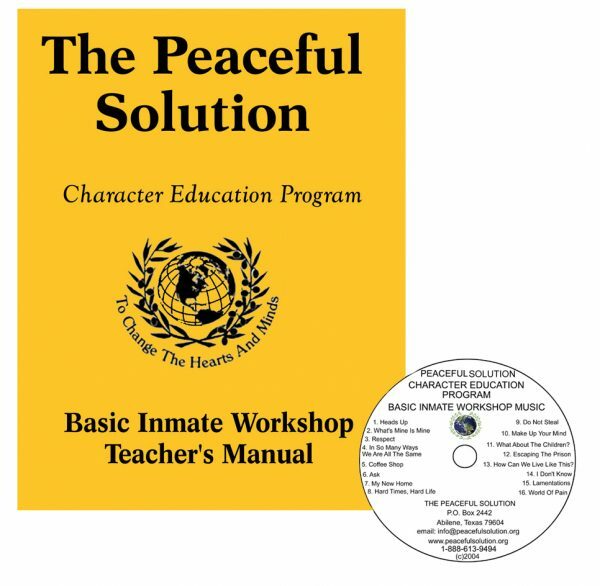 The Peaceful Solution Character Education Program is a perfect guide for human behavior. Questionnaire – Character Assessment survey. Lesson One – Heads Up. Students will increase their awareness of the effects of crime and violence on society, perpetrators, vicitms and their families. Lesson Two – The Right Character Produces Positive Outcomes. Introduction to character. What is character? Why is it important? Discuss the benefits of having right character and the consequences of negative character. Lesson Three – Respecting The Rules Of Possessions Shows Right Character (Part I). Introduction to ownership. Students are taught that everyone has private belongings and rights concerning them. They will learn the importance of following rules and safety guidelines concerning possessions. Lesson Four – Respecting The Rules Of Possessions Show Right Character (Part I). Students will learn why possessions should be obtained honestly and explore ways of doing so. They will also identify and discuss how to avoid conflict over the use of possessions. Lesson Five – Treat Others As You Want To Be Treated. Students are taught to identify different authority figures and how they can show respect to them. They will identify ways of showing care and concern for others and the benefits and consequences that arise. Lesson Six – Ask Before You Take. Students will understand the concept of asking. They will realize the negative consequences that come as a result of not asking permission before doing, taking or touching certain things. Lesson Seven – Improve The Quality Of Life Through Self-Control (Part I). Students will learn what self-control means and the benefits of applying self-control. They will see the importance of using self-control to obey all authority figures. Lesson Eight – Improve The Quality Of Life Through Self-Control (Part II). Students will become aware of proper ways to apply self-control when dealing with a conflict. They will understand why using self-control in following instructions is for their betterment. Lesson Nine – Improve The Quality Of Life Through Self-Control (Part III). Students will appreciate that they can always reconsider and make a wise choice instead of a bad one. They will see the relationship between respecting others’ privacy and self-control. Lesson Ten – Do Not Steal (Part I). Students will learn what stealing is and the harmful effects and conflicts that arise because of stealing. They will recognize the importance of being honest and the importance of practicing honesty. Lesson Eleven – Do Not Steal (Part II). Students will learn different forms of authority and how stealing can occur when rules or regulations set by these authorities are neglected or disobeyed. They will understand that violence is a form of stealing. Lesson Twelve – Conform To What Is Right. Students will understand the difference between acceptable and unacceptable conformity. They will explore their current situations and determine what positive choices they can make to create purpose in their lives. Lesson Thirteen – Now That I have It, How Do I Keep It? Students will see the importance of maintaining a right character amidst negative influences. They will develop decision making techniques to assist them to make the right choices in any situation.